The Aluminium Broad Step Single Ladder that we offer is made from sides and steps for firm foot hold grip. Made form side of Aluminium “C” Section 66.66 X 31.75 X 3. MM Step 12” top To top Aluminium “C” section 66.66 X 31.75 X 3. MM Solid rubber shoes & Nat Bolt etc. hanging bracket one person handle . Heavy Duty Structure, Light In Weight, Our Aluminium Broad Step Single Ladder can be used against the wall support only. 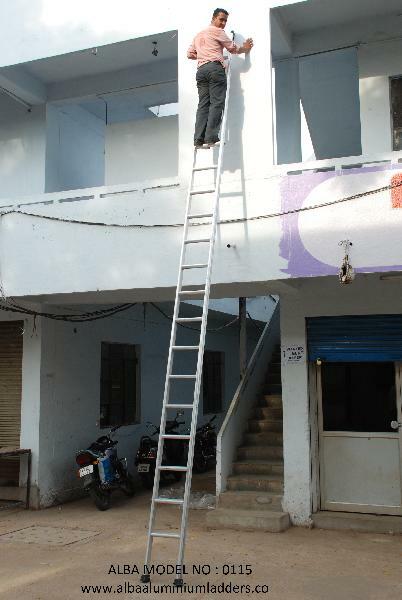 The Aluminium Broad Step Single Ladder possesses lining on steps that helps in climbing. Aluminium Broad Step Single Ladder is fitted with Solid Rubber Shoes and Caps for complete comfort. Aluminium Broad Step Single Ladder Manufacturer & Supplier in (India).